Love this fiber supplement! Great price too. I blend it into all kinds of smoothies but it is even good in plain water. Great way to get your daily fiber intake. Fiber -3 by NOW Foods is great. I was having stomach issues and began taking this per my ND's recommendation and have been very happy with it. It doesn't give me any gas or bloating, just helps with digestion. 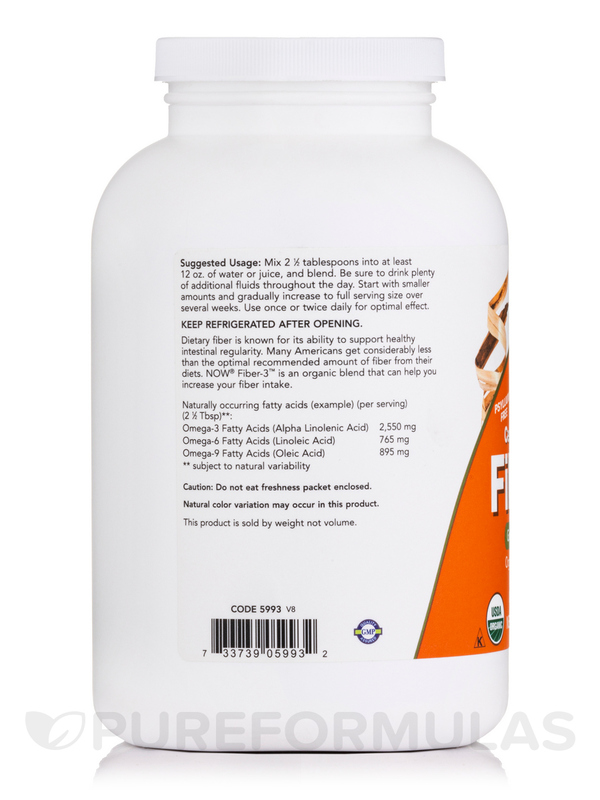 Dietary fiber is known for its ability to support and maintain intestinal regularity. Many Americans get considerably less than the optimal recommended amount of fiber from their diets. 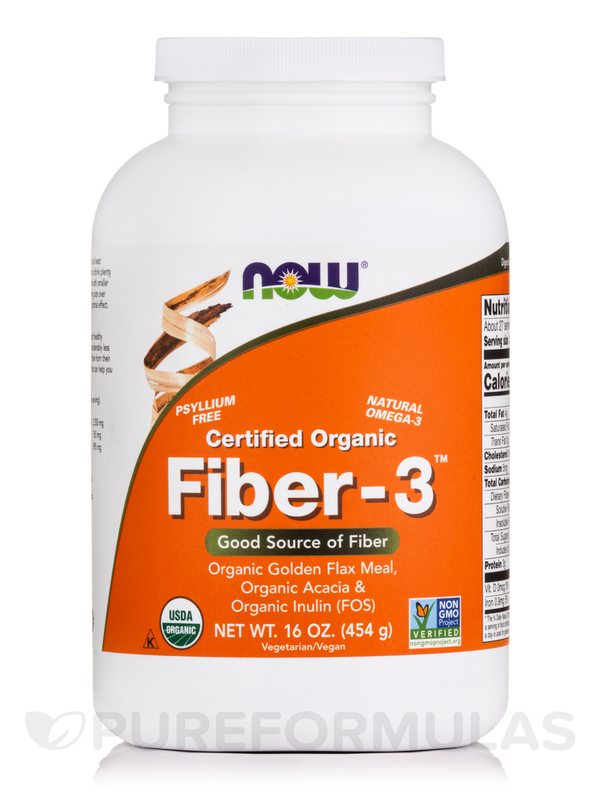 NOW® Fiber-3™ is a combination of fibers from certified organic Golden Flax Seed Meal‚ Acacia‚ and Inulin that can help you increase your fiber intake. Golden Flax Seed contains both soluble and insoluble fibers as well as lignans that can act as antioxidants. Acacia is rich in soluble fiber that can help to control gas and bloating associated with high fiber intake in some individuals and Inulin acts as a prebiotic‚ providing food for friendly intestinal bacteria. The properties of the three fiber sources combined in NOW® Fiber-3™ work together to support and maintain healthy intestinal flora and regularity. Calories Per Gram: Fat 9 - Carbohydrate 4 - Protein 4. 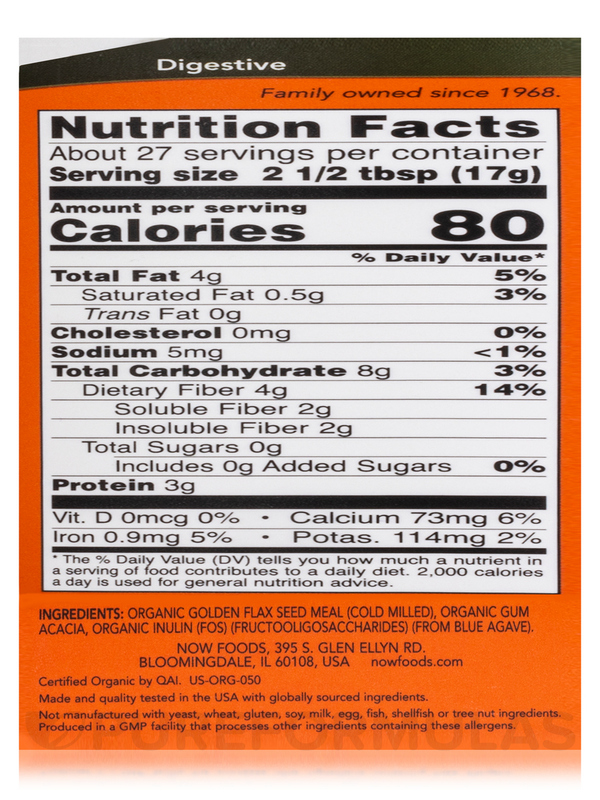 Ingredients: Organic golden flax seed meal (cold-milled)‚ organic gum acacia and organic inulin (FOS) (From Blue Agave). USDA Organic / Non-GMO Project Verified / Vegetarian / Vegan / Psyllium-Free / GMP Quality Assured. Mix 2 1/2 tablespoons into at least 12 oz. of water or juice‚ and blend. Be sure to drink plenty of additional fluids throughout the day. Start with smaller amounts and gradually increase to full serving size over several weeks. Use once or twice daily for optimal effect. Notice: Natural color variation may occur in this product. This product is sold by weight not volume. 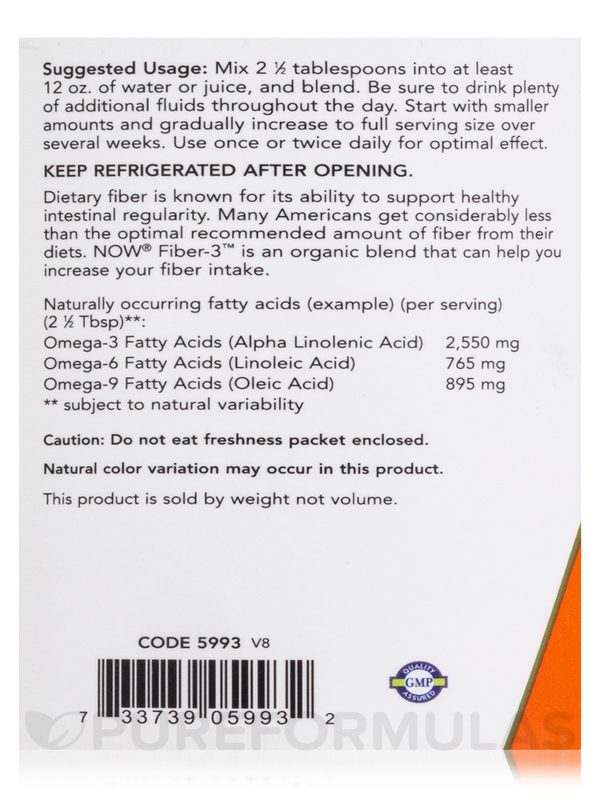 Fiber-3 (Certified Organic) by NOW and it helps with constipation and stomach issues. It works well and I love it! No stomach cramping and it works! I've never ordered fiber powder before and Fiber 3 by NOW is great but not what I was expecting. It basically is ground up flaxseed powder, in terms of look, texture and taste. I like to add it to smoothies and yogurt but if you don't like the taste of flaxseed, then this isn't for you. I was using Fiber O-3 by Protocol for Life Balance, but they discontinued it. A salesman told me you carry the exact same product, only calling it Fiber-3. This product has saved my life! My entire life I've had IBS, and Fiber 3 by NOW Foods is the only thing that has completed cured me. I no longer have any stomach troubles whatsoever! Amazing! Please keep carrying it! Only Pro's! This product works for me! I no longer have stomach pain or diarrhea! I am a "normal" person now! I like NOW Foods Fiber-3 but switched to RAW FIBER. I use Fiber-3 by NOW everyday. I have a lazy gut and lack the normal amount of bacteria to properly digest my food without having horrible stomach cramps. Sometimes I would be in a ball on the floor unable to move from my cramps. I love Fiber-3. If I use it daily I don't have to deal with cramps anymore. I used to try regular fiber pills, but they never really worked for me. Its incredibly important to be regular, so you can release all the toxins your body is trying to dispose of. If you don't all those toxins remain in your body and continue to poison you. When I am regular I notice not only do I not feel so bloated, but my emotions are more stable. I overall feel much better. This particular brand works just as well as the product my doctor recommended. I believe this is due to the fact the ingredients list is practically the same. My doctor originally recommended a different fiber supplement but this brand's (Now Fiber-3) ingredients list matches the same product my doctor recommended and is also half the price. Not only did the ingredients list match exactly but so did the amount of each ingredient. I am also allergic to psyllium and this fiber doesn't contain psyllium, so it works great for myself. 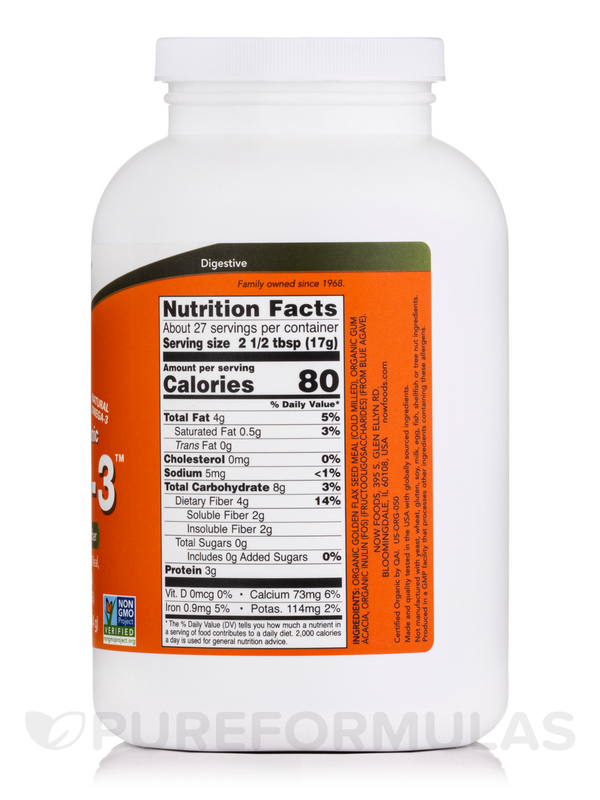 I don't like being dependent on any type of supplement, but either way I need help to digest food whether it is Fiber-3 or another. is it gluten and dairy free? Hi Pamela, thank you for choosing Pureformulas. This product is gluten and dairy free but this product has been produced in a GMP facility that processes other ingredients containing these allergens.